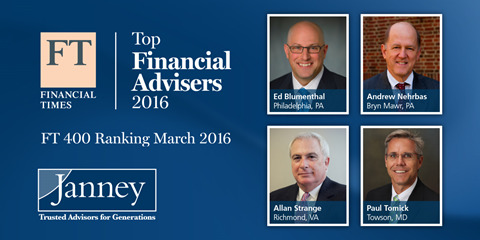 PHILADELPHIA, PA – MARCH 31, 2016 – Janney Montgomery Scott LLC (“Janney”) today announced that three of the firm’s Financial Advisors have been named to the Financial Times 2016 list of Top 400 U.S. Financial Advisors. The advisors named from Janney are: Edward Blumenthal of Philadelphia, PA; Andrew Nehrbas of Bryn Mawr, PA; Allan Strange of Richmond, VA, and Paul Tomick of Towson, MD. The formula used by the Financial Times to select the top 400 advisors was based on six broad factors including; assets under management; asset growth; years of experience; industry certification; Financial Industry Regulatory Authority (FINRA) compliance record and online accessibility. In addition, to be considered for the FT 400 list, advisors must have a minimum of 10 years’ experience and at least $200 million in assets under management. Ed Blumenthal serves as Executive Vice President/Wealth Management and a senior partner of Stedmark Partners at Janney Montgomery Scott. An Accredited Wealth Management Advisorsm, Blumenthal was previously named a Barron’s “Top Advisor” in 2013, 2014, 2015 and 2016. He was also was named a “Top 400 Financial Advisor” by Financial Times in 2013 and 2014. Blumenthal is a board member and serves on the Executive Committee of the Eastern Pennsylvania/Delaware Regional Chapter of the Anti-Defamation League. He has also served on the board of Congregation Beth Tikvah-B’nai Jeshurun and was the chair of the Adult Education Committee. He is an active member of the National Multiple Sclerosis Society, Greater Delaware Valley Chapter’s Planning Team for the MS City to Shore Bike Tour. Blumenthal received his undergraduate degree in economics from the University of Rochester. Andy Nehrbas serves as Executive Vice President/ Wealth Management, bringing to his clients a long and accomplished career with over 40 years of experience in the financial services industry, and was previously named a FT Top 400 Advisor in 2015. He entered the investment business, initially partnering with his grandfather at Parrish Securities. Eventually moving to Merrill Lynch, Andy quickly rose to become a member of the President’s Council and then, in 1984, joined Legg Mason. A 22–time member of Legg Mason President’s Council and a Managing Director, Andy also held the position of Branch Manager for the Legg Mason Bryn Mawr, Pennsylvania office. In 2009, Andy joined Janney Montgomery Scott LLC. Andy is a graduate of Franklin and Marshall College. He is an avid squash player, having recently won the 50’s National Amateur Championship in men’s doubles. A former President of the Merion Cricket Club, Andy is actively involved with SquashSmarts, Inc., and The Village. Allan Strange, Executive Vice President/Wealth Management, has been advising clients on their investments for more than 34 years and was recently named Janney’s Financial Advisor of the Year. An Accredited Investment Fiduciary®, he has been named a Barron’s “Top Advisor” in 2009, 2011, 2012, 2013, 2014, 2015 and 2016 and both a “Top 400 Financial Advisor” and “Top 401 Retirement Plan Advisor” by Financial Times in 2015. He is the founder and first president of the Metropolitan Richmond Sports Backers and past board member of Richmond Forum and the Virginia State Golf Association. An avid golfer, Allan played professionally for 3 years after graduating from East Tennessee State University. Paul Tomick joined Janney Montgomery Scott in April, 2002 as a Financial Advisor. Mr. Tomick had been an Investment Advisor Representative with H.C. Wainwright from December 2000 until April 2002. Prior to that, Mr. Tomick had been involved in both the technology and manufacturing sectors. Most recently, he was a Director at Sylvan Prometric, a division of Sylvan Learning Systems. He was responsible for the strategic planning and servicing of one of the company’s fastest growing business units. Mr. Tomick graduated from Randolph-Macon College and received an Executive MBA from Loyola College. Mr. Tomick has completed courses at the Wharton School of the University of Pennsylvania.